Our range of products include spray dryer, flash dryers, spin flash dryers, fluid bed dryers, rotary drum dryers and paddle dryers. The Spray Dryer are made to convert liquid solutions/suspensions/slurry/emulsions to powder, granules or agglomerates. The gross advantage of spray dryers is consistent product quality with better control on product parameters like product moisture, bulk density, particle size, dispersion, flow ability etc. Capacity: Our scope of plant ranges from 5 kg/hr laboratory models to full scale high volume production models in excess of 15000kg/hr and can meet any required industrial manufacturing specifications. Operating Temperature: The operating temperature ranges from 100-1000ºc. 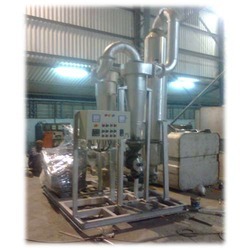 Manufacturing: We manufacture VFD based Spray Dryer. The Flash Dryers is a drying method for solid fluidization. We are a highly reputed provider of the Flash Dryer Machine which is manufactured using advanced technology. 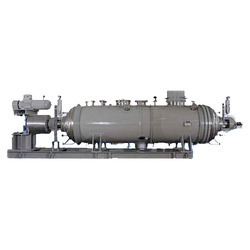 Flash dryer are manufacture for the flash drying of wet particles with “surface water” from centrifugally where the product can be dispersed by the high air velocity prevailing in the flash dryer. The turbulent dispersion and mixing of the wet particles in the air allows high temperatures of the inlet drying air due to the cooling effect provided by the fast evaporation of the moisture from the particle surfaces. PMI Flash Dryers Controls the Moisture And Fineness of the Products. We are specialized in manufacturer and supplier of optimum grade Spin Flash Dryers. Manufactured by our experienced professionals in our advanced fabrication unit, our offered dryers are checked by our quality controllers on different parameters. The material is fed by screw feeder through a variable speed drive into the vertical drying chamber where it is heated by hot air and at the same time disintegrated by a specially designed disintegrator. The heating of air may be direct or indirect depending upon the application. 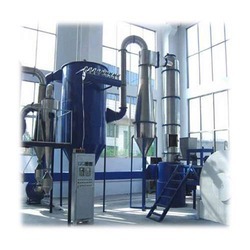 The dry powder is collected through cyclone separator / bag filter or with combination of both. We provide this range to our valuable clients in various customized options as per their specific requirements. Clients can avail the offered range at industry leading prices. Spin Flash drying technology leads the world in drying of cohesive and non-cohesive pastes and filter cakes, as well as high-viscosity products. The Fluid Bed Dryer Machine offered comprise precision designed and developed range of Fluid Bed Dryers that find primary usage in industry sectors like food, dyestuff, chemical, pharmaceutical and other process industries. These systems provide for drying materials through fluidization using hot/dehumidified air that creates turbulence in wet product while flowing through it. In the vibrated fluid bed dryer, the material is easily transported through the dryer by the combined effect of fluidization and vibration. The fluidization velocity can be judiciously selected, to minimize entertainment of the smaller particles, to avoid gas bubbling m the fluid bed thereby minimizing attrition. The residence time can be adjusted, by varying the bed height, through the overflow weir position. A cooling section can also be provided, by partitioning of the plenum chamber. PMI FBD are offered in static as well as Vibratory Design and are used for amorphous/ crystalline products with relatively close particle size distribution. PMI FBD offers better control on fluidization, residence time, product moisture and dust levels. 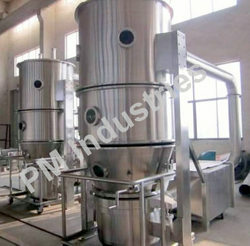 PMI FBD are applied for particles between 50 microns and 5 mm. We design the offered Rotary Drum Dryers in various sizes, designs, specifications for our offered clients. In addition to this, only high quality raw material is used while manufacturing the offered range that ensures its durability and excellent quality. This rotary drying machine comes with thermocouples on the feeding and discharging device to control the temperature. Thermometers are also adopted so as to better control the working temperature of the rotary drier. The internals are designed to ensure uniform distribution/showering over the entire cross section. The entire shell is supported on rollers tyres and rotated by means of girth gear or by means of a friction drive. Sealing arrangement are also provided so as to have a minimum air leakage and product/Thermal losses. 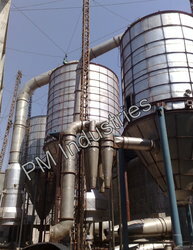 Distillers grains, Residue, Bagasse, Sludge, food factory waste, Organic fertilizers Drying etc. The Paddle Dryer are highly efficient mechanically agitated, indirect heat transfer devices that add or remove heat from process mass. Dual counter-rotating shafts with unique intermeshing wedge shape paddles produce intimate mixing and optimize heat transfer. PMI offers vapor tight designs for applications with volatile organic compounds or hazardous materials. Temperature sensitive materials can be dried at low temperature under vacuum. The wet feed is continuously agitated by the heated rotating blades, thus exposing new areas to heating surfaces. This results in the moisture boiling off and rendering the wet material dry to the required degree. PMI dryers are have prove In their worth many times and are universally useful. They serve primarily the drying in batches of moist-crumbly and/or powdery crystalline products. This dryers a high-speed, thin-layer, indirect-contact, paddle processor. 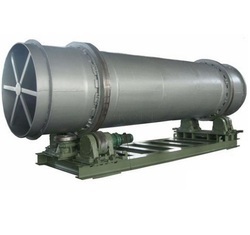 It consists of a horizontal, cylindrical vessel containing a longitudinal rotor / paddle assembly. The vessel body is fabricated with external jacket sections through which flows the heat transfer fluid Radial paddles are fastened to the rotor shaft by means of locknuts. PMI Paddle Dryers has Common base frame has Compact installation.